A by-the-numbers breakdown of who's doling out our water, where it's being sent from and how it might change in the future. California Gov. Jerry Brown dropped a bomb earlier this month: He was ushering in mandatory reductions in municipal drinking water use, for the first time in state history. These cuts range from 8 percent to 36 percent for water agencies – and their customers – across the state. They’re designed to conserve up to 25 percent of the state’s drinking water supplies. The regulations have not yet been finalized, but they may change the way you have to use water. First off, remember that if you live in San Diego County, your tap water and your water bill come from one of two dozen different local agencies. The biggest of those agencies is the city of San Diego’s Public Utilities Department. Most local agencies get the vast majority of their water from the San Diego County Water Authority (which is not, by the way, part of the county government). The water agency is known as a water wholesaler that imports water and sells it to the 24 local water agencies in the county. About 97 percent of county residents get water that comes from the County Water Authority, so I’m using the county and County Water Authority interchangeably for the purposes of this explainer. The San Diego County Water Authority’s supply in 2014 was 670,000 acre feet of water, the typical measure for big amounts of water. One acre foot is roughly enough to cover a football field in a foot of water. Two four-person families use about an acre foot of water each year. Over the past five years, about a fifth – 19 percent – of the county’s water comes from the Sacramento-San Joaquin Delta, according to the County Water Authority. Far more – 64 percent – of our water comes from the Colorado River. Though only bits of eastern California are in the Colorado’s basin, the river’s water is tightly controlled and moved west through aqueducts and canals. That’s about how much of the county’s water flows through pipes and aqueducts controlled by the Metropolitan Water District, the Los Angeles-based supplier that delivers water across Southern California. 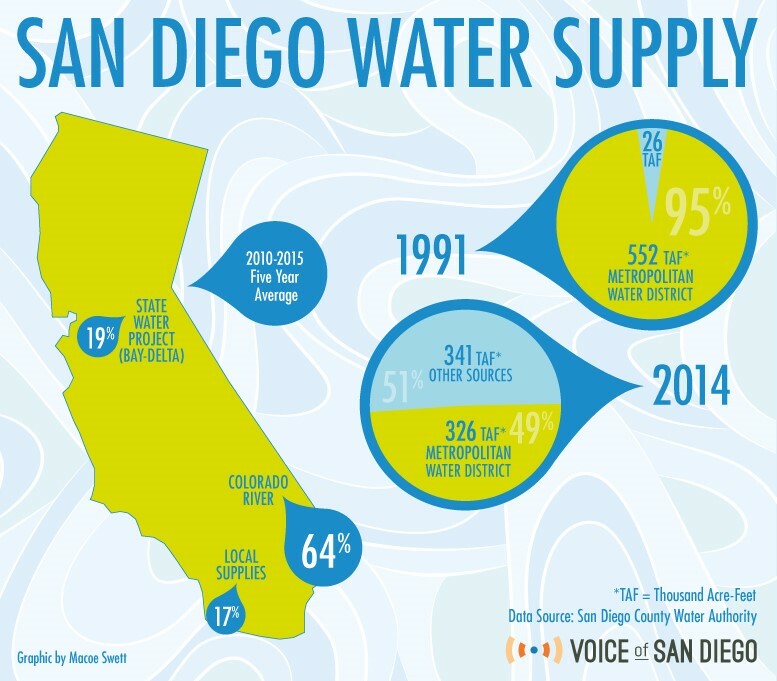 San Diego once bought about 95 percent of its water from Metropolitan. That’s changed significantly since a drought over two decades ago made San Diego officials worry they were too dependent on that one source of water. Now, San Diego buys just less than half of its water from Metropolitan – that includes all the Northern California water we use and about half of the Colorado River water we get. But the county still relies on Metropolitan’s massive delivery system to bring us the other half of the Colorado water supply. That water has a different legal status and comes here thanks to two canal lining projects that increased the amount of water flowing west from the Colorado, and from a deal the county cut with the Imperial Irrigation District. Even though Metropolitan delivers some of that water, the water itself is not Metropolitan’s. There’s an ongoing legal fight about how much Metropolitan charged San Diego for delivering that water. That’s how much county water came from local sources over the past five years – so, that’s groundwater and surface water here in the county itself. A new desalination plant in Carlsbad is expected to open this fall and add to local supplies. The county also says 11 percent of its water is “conservation” water. This water, though, doesn’t appear magically: It is from the sources listed above. That’s at least how much water is used by farmers in the county. Because of how it’s calculated, the figure doesn’t capture all the agricultural water used in the region. The general managers of the Rainbow and Valley Center water districts each said farmers use about 65 to 75 percent of their agencies’ water. Each of those districts is small compared with the city of San Diego, which uses about 40 percent of the county’s water. In the city, about 18 percent of water is used outdoors, for things like lawn care, according to the Public Utilities Department. That’s a hard figure to come by because it relies on a few assumptions, namely that a single-family home uses about half of its water outside the house. About 36 percent of city water is used by single-family homes. Another chunk of the city’s water, about 15 percent, is used for various other kinds of irrigation, including golf courses. Other industrial uses account for 25 percent of the city’s water use. The county and the city are both working to increase their supply of local water. The County Water Authority wants to eventually depend even less on the Metropolitan Water District – it hopes to buy only one-third of its water from the agency by 2020. The decrease in reliance on Metropolitan will be made possible largely by new water coming from the Colorado River and from desalination, which the County Water Authority expects to provide about 7 percent of the county’s water by then. The county projects it will get about 56,000 acre feet of water a year from the Carlsbad plant. Even though the state is going to ask municipal water customers across California to reduce their water use by an average of 25 percent depending on where they live, the San Diego County Water Authority is not that short on water. That’s because the governor’s cuts do not necessarily correspond to regional water supplies. The county estimates it may have between 95 and 101 percent of the water needed to meet residential and business customers’ demand over the next year – even without the state’s mandatory restrictions. Gary Arant, the general manager of the Valley Center Water District, said he talked last week with a group of local real estate agents about how residents could be asked to make steep cuts even as regional water supplies might meet or slightly exceed current demand. In that case, some residents may be told to reduce their water use by 36 percent even as the county is stockpiling water in a reservoir for future years. “When I finished describing this to them, I had people looking at me like I was nuts,” Arant said. Correction: An earlier version of this story said about 13 percent of water is used outdoors by single-family homes. It’s roughly 18 percent.